THE PICKIEST EATER IN THE WORLD: I GOT STUNNED BY THE BURGER KING STUNNER MEAL!! A few days ago, I visited Emerald Avenue for the first time in a very long while. Emerald Avenue has a special place in my heart because the office of my very first job was located there. Its actually quite humbling when I look back and remember that from a cramped office of my boss’ business wherein I was the very first employee, the company has grown, and branched out to different companies, giving jobs to around one hundred employees. Although I do have many fond memories of Emerald Avenue, an annoying little factoid is that there weren’t too many places to eat at when I worked there. 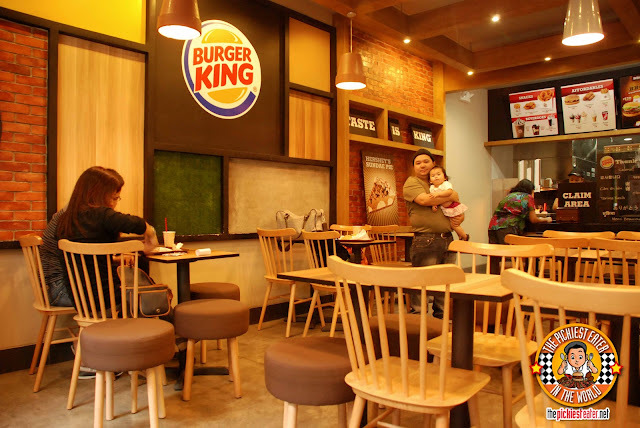 Now, it’s the home of practically every single fast food restaurant you can imagine. 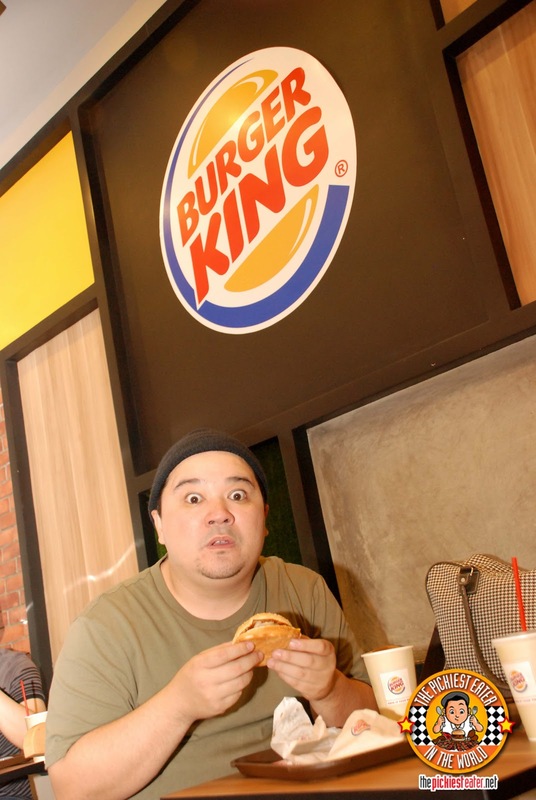 One particularly painful discovery for me, was the sudden presence of Burger King at the ground floor of the building beside where I used to work. I cannot express how many times I felt that an exhausting working day could have been made even a lot better by one of their flame grilled burgers and an ice cold glass of Hi-C Apple. During my stroll along Emerald, the lure of Burger King was too strong, I couldn’t help but drop by (I really didn’t put up too much of a fight). Since I was on the go, I wanted something quick but filling and not too expensive. So what could Burger King possibly have in store for me? A meal that would leave me completely stunned. First off, I want to say that I really like BK’s new industrial meets country look. It looks classy, sleek, and modern. Although I didn’t really think there was anything wrong with their old fashioned look apart from it being.. well.. kinda drab, this is a nice improvement without going overboard. 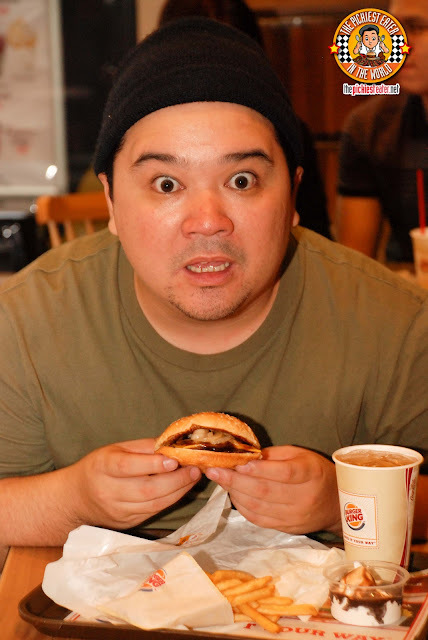 I glanced through Burger King’s menu and saw that they had a BBQ Burger value meal. As I may have mentioned before, I’m a sucker for Burgers with BBQ Sauce and onion rings in it, so off the bat, I knew this is what I wanted to order. So when the nice young lady by the counter asked for my order, I just pointed at the picture above the counter. With a smile, she said, “That will be P99, sir”. I had to bend over to pick up my jaw that had dropped down to the floor. I was left in disbelief at how a meal so complete, so tasty, from a highly regarded fast food join such as Burger King no less, could offer something so affordable! 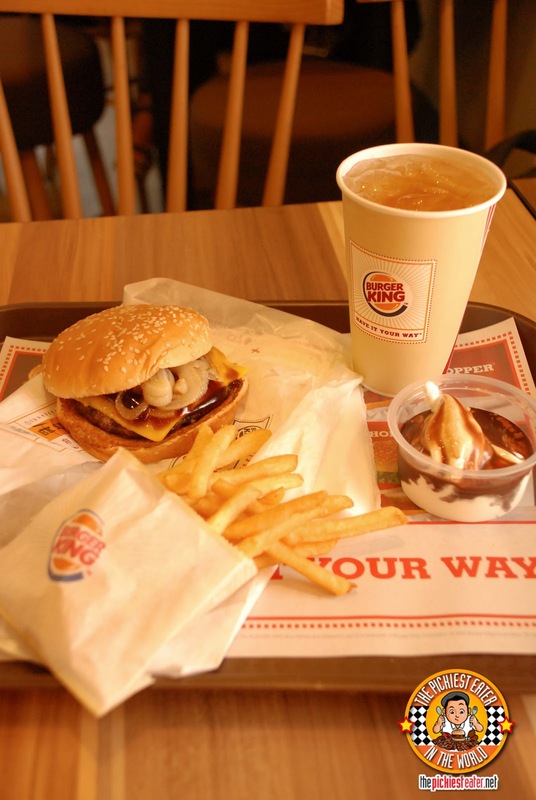 After gazing at my tray of food, it becomes clear why Burger King’s BBQ Cheeseburger Stunner Meal was so aptly named. And mind you, this wasn’t some run of the mill burger either. Burger King’s BBQ Cheeseburger is a juicy flame grilled all beef patty, laid out on a toasted bun, and slathered in sweet and tangy BBQ sauce, and topped off with Cheddar cheese and caramelized onions.. Like I said.. Everything I look for in a Burger (with the exception of Bacon, of course). Since the motto of Burger King is “Taste is King”, I asked if I could swap the soft drink for my all time favourite juice drink, Hi-C Apple (which was no problem) because I felt it would be more suitable to my taste buds. If I wanted to upsize my fries and drink, I just needed to add P40 bucks! Having a mini sundae is the perfect ending to a delicious meal, as it soothes your taste buds after the harmony of flavours that the burger and fries brings. 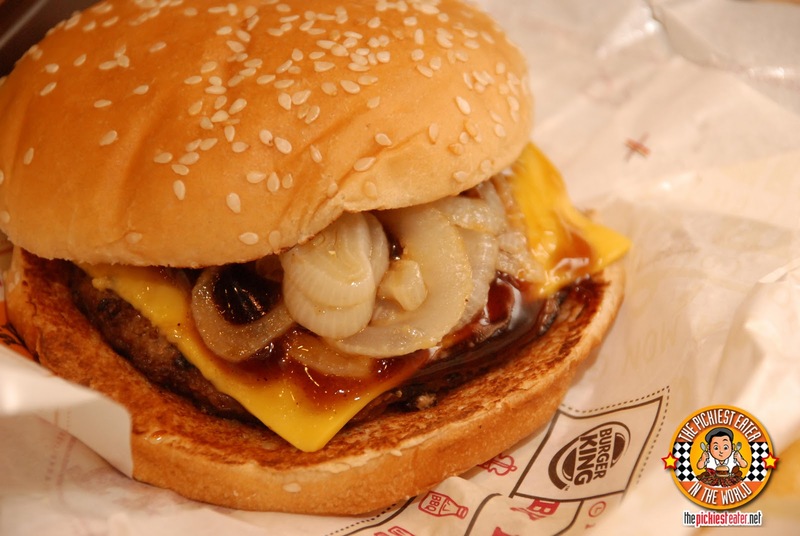 And just when you thought it couldn’t get any better, Burger King also offers a BBQ Cheeseburger DUO Stunner meal.. Meaning two sets of these bad boys for only P189! If that isn’t enough to leave you completely stunned I don’t know what else will! 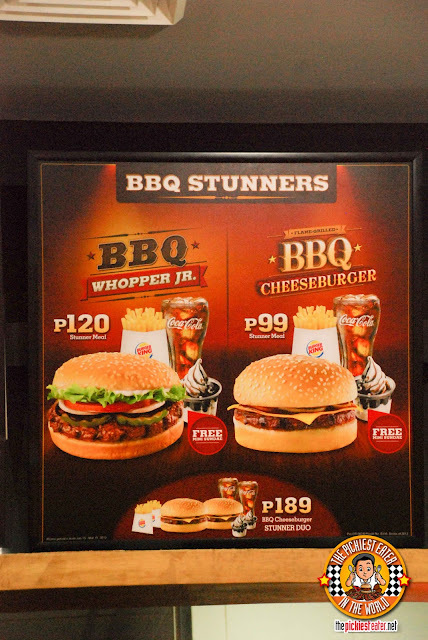 Also available is the BBQ Whopper Meal for only P120, which will be my next target when I go back to Burger King (soon)! Hihi. Funny post. I love how you wrote it. :)) Anyway, BK offers good stuff at very affordable prices! And you're absolutely right, BK does have some great stuff! WOAH! Great post as always! This definitely stunned me. I was flinching for a moment there, when you divulged the price. Gah! Wish we had that here in Cebu already! Give it a go Andrew! Great deal for P99 bucks!